Who is Lachlan Culjak? I can’t even begin to tell you how many times I’ve heard this name murmured in Halifax’s culinary community over the last few months. It’s become a bit of a fun running joke, yet you know it’s serious when chefs keep asking but still keep piping up with their own intel. “He worked at Noma in Copenhagen” (voted number one restaurant multiple times by San Pellegrino’s World’s 50 Best Restaurants). “He just arrived in Halifax straight out of Michelin-starred restaurants in Asia.” “He’s looking for investors for his own restaurant.” For me, he sounded a little bit like a Bond villain, because doesn’t everyone want to be a Bond villain? To other friends, he sounded like the guy who saves the day. And on and on we go; everyone’s curious. 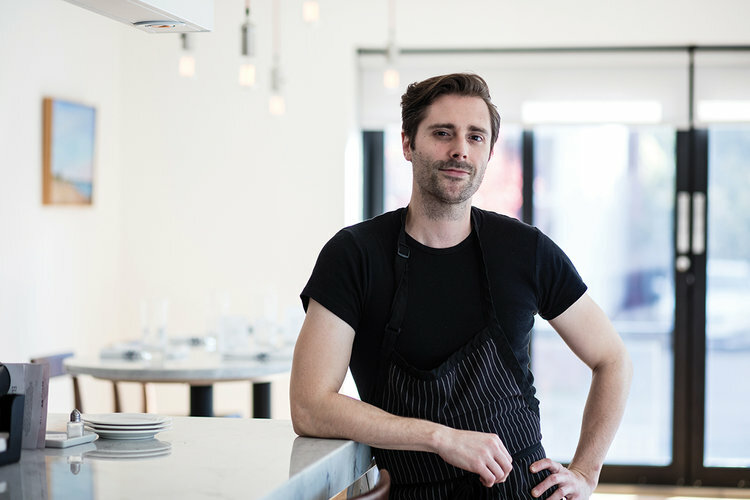 Lachlan has come full circle, finally returning to Halifax this February after a bit of a world tour as a chef. He grew up on Lawrence Street, just steps away from where the restaurant is now. After graduating from Nova Scotia Community College’s culinary program in 2001, he hit the road for Toronto, eager to gain experience around the world from behind the line. 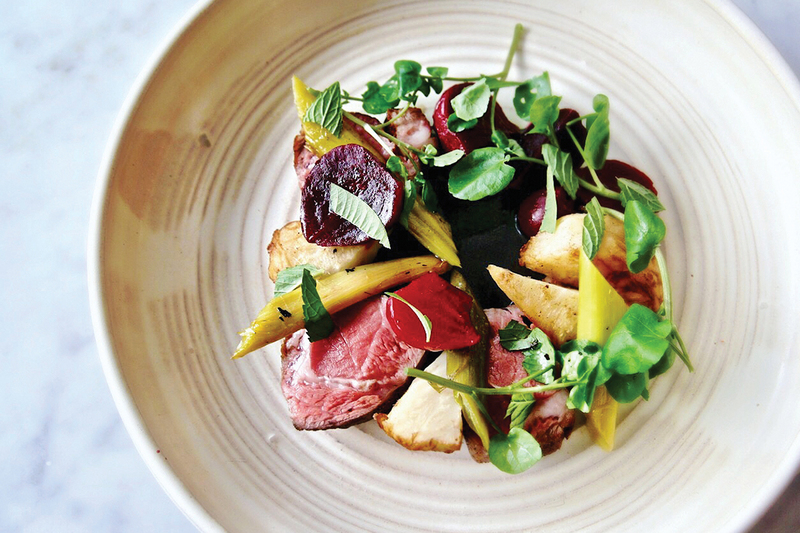 For a young chef, his is an impressive pedigree, which began with an apprenticeship with T.O. Chef David Lee at Splendido and then a move to help open Nota Bene. Shortly thereafter, he jumped in with New York Chef Scott Conant to help open Scarpetta Toronto and Las Vegas. Then it was off to stage and work in both Europe and the U.S. — notably in two Michelin-starred restaurants: Mayer’s at Schloss Prielau in Zell am See, Austria; Noma in Copenhagen, Denmark; and Corton in New York with legendary chef Paul Liebrandt. And much later on, back in Toronto at the helm of Yours Truly — a neighbourhood restaurant with a speakeasy feel that garnered rave reviews for its 25-course tasting menu. And the buzz continues. During this interview Johanna answers the restaurant’s phone to take a reservation from an excited diner who asks if the chef will be in the house tonight. As I chat with Lachlan, I’m sitting at the chef’s counter checking out containers of leek ash, bottles of parm oil (as in the cheese), tasting slow-roasted kelp fresh from the oven and examining the sourdough starter. Keep in mind that Lachlan has been at this restaurant for only a month. I feel like I should take a moment to explain, in layman’s terms, what it means to be a chef who is “staging.” It’s a badge of honour in the chef community, a stepping stone. It’s the opportunity to spend a bit of time and possibly a working vacation in one of your chef idol’s kitchens or learn a new cuisine in another part of the world — and so much more. It’s an unofficial extended training program and an accepted part of the business. It’s not without problems, but many other industries could stand to benefit from this kind of renegade approach to continuing education. It’s about building networks and community, making links with other similarly driven, like-minded people from around the world (likely at the same point in their careers) who are drawn to the same chefs, sensibilities, cuisines. So, when Lachlan staged at Noma, he became friends with Nurdin Topham. 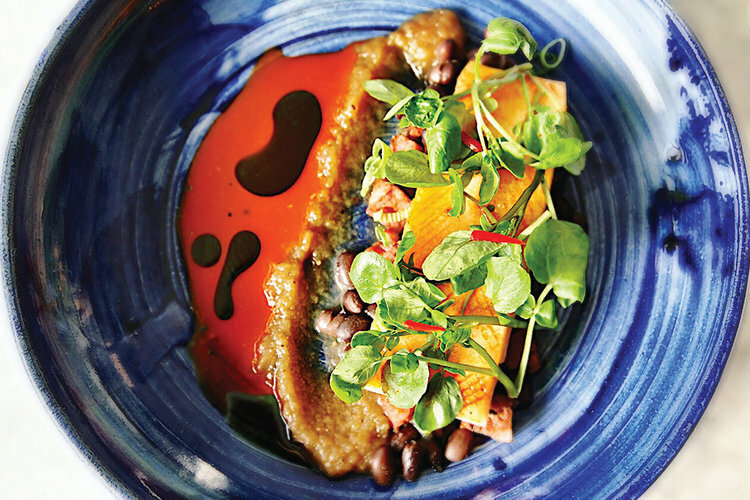 The two of them saw eye-to-eye on technique, and Nurdin schooled him in taking a holistic, nutritional approach to ingredients with an aim of creating dishes that were equal parts nutritious and satisfying. Lachlan admits that the knowledge and understanding of nutritional value is missing from modern cooking. Nurdin went on to open Nur in Hong Kong, and Lachlan joined him, seeing it through to its first Michelin star before returning this past February. Not bad for two chefs who befriended each other under René Redzepi’s watch in Denmark. The important thing to note here is the wide range of culinary techniques Lachlan has accumulated along the way. His cuisine is most definitely marked by each experience, from classical French to eccentric, upscale Italian to new Nordic cuisine to the basic fundamentals of foraging, fermentation, preservation and charcuterie. Lachlan explains how each restaurant really opened his eyes to techniques, gave him a new appreciation of ingredients and had him cooking way outside the box on a regular basis. And it’s evidenced in his dishes and solid plating techniques, which are bright and colourful, featuring seasonal produce that’s roasted, puréed or pickled for that perfect kind of umami balance. Johanna reckons she’s produced 400 hours of food television over her 20-plus-year career thus far. Her filmography includes The Inn Chef, Chef at Large, Red, Hot & Ready, The Food Hunter, The Château Dinner, Chef Abroad, French Food at Home and Spice Goddess. Arguably, she put the likes of Michael Smith, Laura Calder and Pete Luckett on the international map. She’s shot in some of the world’s top kitchens. The Food Hunter alone filmed in 19 countries from Tahiti to Chile. When I pry a little bit, the stories come pouring out: filming in the kitchens of The Royal York Hotel (practically the size of a football field), bargaining to get film crews out of sticky situations like unrest in Thailand, heading to war with the American Navy, and capturing diners and crew suspended in cranes for a meal over South Africa. The space at Eliot & Vine has a European feel, which is an homage to the formative years Johanna spent in Greece as a teen while her parents worked there as archaeologists. And that essence is certainly captured with the tilework, the white marble countertops, the warm wooden wine crates and the Mediterranean blue banquettes, especially when flooded by midafternoon sun from all of the windows. It’s upscale without being too precious, and a clientele of regulars who can just walk there from within the neighbourhood is steadily growing. 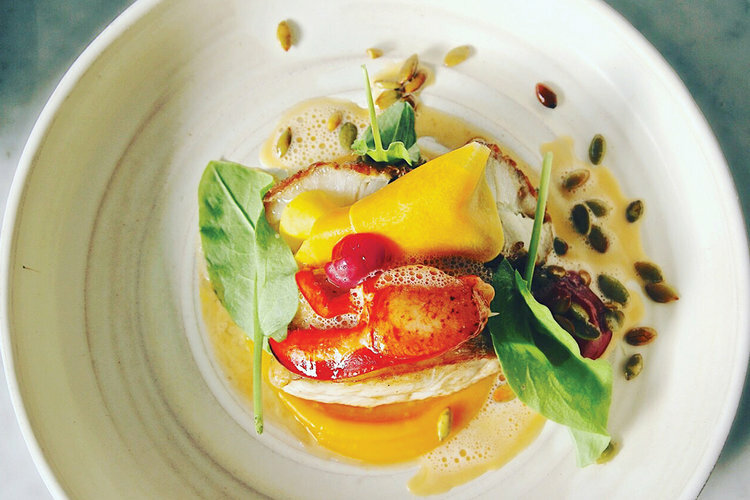 Lachlan did return from Hong Kong in February with a picture in mind — opening his own restaurant and putting down roots — but honestly, the right combination of space, timing and investors wasn’t coming together upon his return to Nova Scotia. The idea isn’t dead, though, it’s just parked. “This is a great time to be cooking in Nova Scotia,” says Lachlan. “There’s a real renaissance in food — amazing products, local artisans and an excited dining public.” Frankly, I’m looking forward to warming a seat at Lachlan’s counter on a regular basis with friends this winter, as long as he pulls no James Bond business on us. Bring it on, Chef.